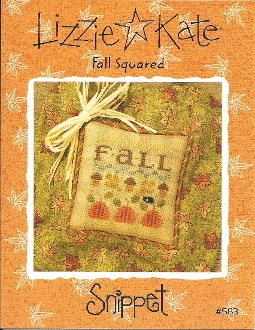 This design is bursting with beautiful autumn colors and motifs. There's a trio of pumpkins, falling leaves, and acorns. This classic square design is great in a frame or a pillow AND you can enjoy it past Halloween, right through Thanksgiving. Gather your supplies and harvest a stitching bounty! Design size: 3" x 3". Stitch count: 42w x 43h. Instructions given for Weeks Dye Works Threads (not included) with conversions for DMC and Anchor embroidery threads. Model stitched on 28 count overdyed gingham linen, 2 over 2 (not included). Raven button is not included.